We live in an era in which both political parties are becoming more extreme and states are becoming more and more polarized. In the House of Representatives, gerrymandering, the process of dividing an area into districts to give one political party an electoral advantage over the other, is partly to blame. 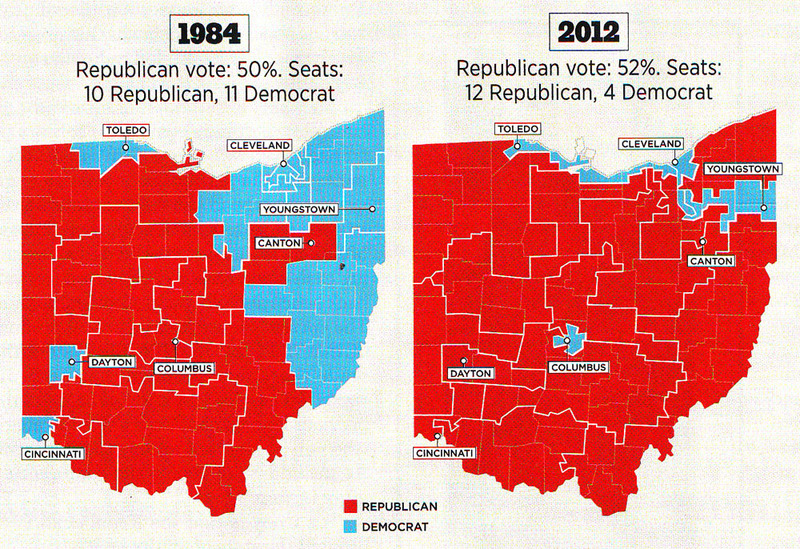 Both parties have played around with district borders countless times, producing polarized voter blocks. “Lawmakers no longer need to appeal to the political ‘middle’ to try to win general elections, but must instead deliver only to their own party’s true believers,” writes Luisa Ch. Savage in Maclean’s, a Canadian current affairs magazine. 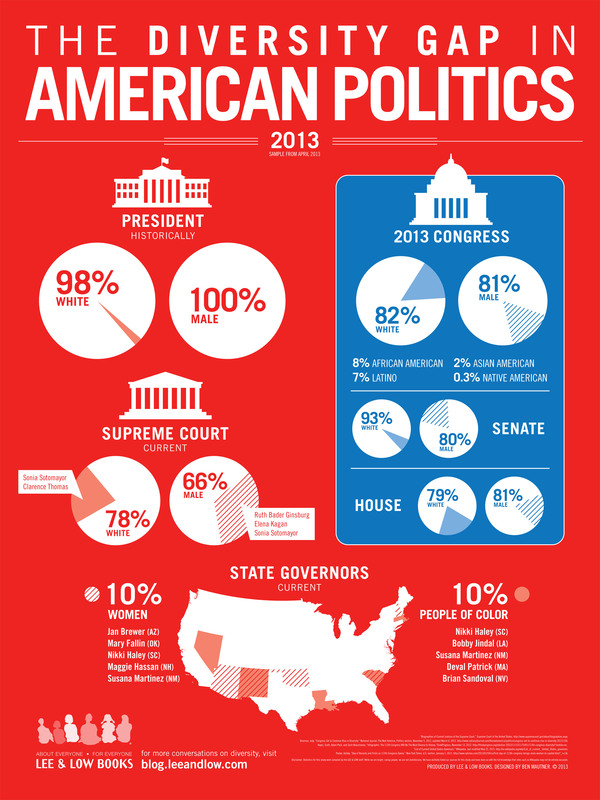 However, many political experts say that the polarization goes much deeper. Gerrymandering doesn’t affect Senators (you can’t redraw state lines), but the Senate is just as polarized as the House. This points to increasing polarization of states. “There used to be a great many states that were very competitive in national elections. In 1976, almost half the states in the union came within 3 points of the nationwide vote in the presidential election. A more impressive 30-plus states were within 5pt. Today, the numbers aren’t even close to that,” writes Harry J. Enten in The Guardian. What that means on a practical level is that people who believe different things don’t live or work together. Voter ID laws, which have been passed in more than thirty states, are laws intended to prevent voter fraud by making sure each voter is who he or she says he or she is. The laws do this by requiring special forms of ID, which vary state to state. Some states require only a current utility bill or bank statement while the strictest states require a government-issued photo ID. According to New York University’s Brennan Center for Justice, about 11% of US citizens (roughly 21 million) do not have government-issued photo IDs. In a close election, that could certainly be enough to change the outcome, even if all of those people were not regular voters. Among minorities, the percentages are even higher. According to the NAACP, 25% of African Americans and 16% of Latinos of voting age lack a current government-issued photo ID. The United States has one of the lowest voter turnout rates among democratic countries. The right to vote should not be taken for granted. Not so long ago, women and minorities in the US could not vote. A person cannot complain about the way things are if he or she does not bother to vote. According to the United States Election Project at George Mason University, the 2012 election had a 58.2% turnout rate among the voting eligible population. Some people point to certain barriers to voting such as registration, voter ID laws, and the scheduling of elections during the workweek as reasons for the low turnout among low-income voters. However, Fairvote.org asserts that the biggest factor in voter participation is probably voter motivation and the perception that votes will or will not make a difference. In 2010 the Supreme Court ruled on a case called Citizens United vs. Federal Election Commission. In that ruling, the Court said that the First Amendment, which guarantees free speech, prohibits the government from restricting political independent expenditures by corporations, associations, or labor unions. Among other things, this meant that big corporations were allowed to spend unlimited funds to lobby for a particular candidate, often through third-party independent groups called super PACs. Before the Supreme Court’s ruling in 2010, the law governed corporate election spending under the assumption that “corporations had so much money that their spending would create vast inequalities in speech that would undermine democracy,” according to the libertarian Cato Institute. If the rich use their money to speak, it goes hand-in-hand that those without money (including many people of color, who make up a disproportionate percentage of low-income Americans) are left without a voice. Women and people of color in politics face both overt and subtle prejudice when campaigning and attempting to do their jobs. Much has been written about the ways in which President Obama has been treated because of his race. For example, although President Clinton also faced strong opposition, “no one called Clinton a ‘food stamp president’ or attacked his health care plan as ‘reparations.’ Local lawmakers didn’t circulate racist jokes about the former Arkansas governor, and right-wing provocateurs didn’t accuse Clinton of fomenting an anti-white race war,” writes Jamelle Bouie in The American Prospect, pulling from a long article by Ta-Nehisi Coates in The Atlantic. Inequality in the representation of women and people of color is an entrenched societal problem. The million dollar question is: Do US leaders and citizens have the will to make the necessary changes to fix government and make it an apparatus that works for all people and not just a chosen few? The following quote by Ms. Horning is why ethnic diverse authors are needed in today’s marketing whether the purpose is to go mainstream publishing or independent self-publishing.